Dusk is drawing on and the sun is past the horizon, leaving rays of orange-cream pop light floating through the trees out back. The flowers in the garden obtain that luminescence they only get in the evening; they and the grass are glowing and I can hear an early cicada trying his wings. He is weeks and weeks out of his due date, I think, and he sings alone so far. 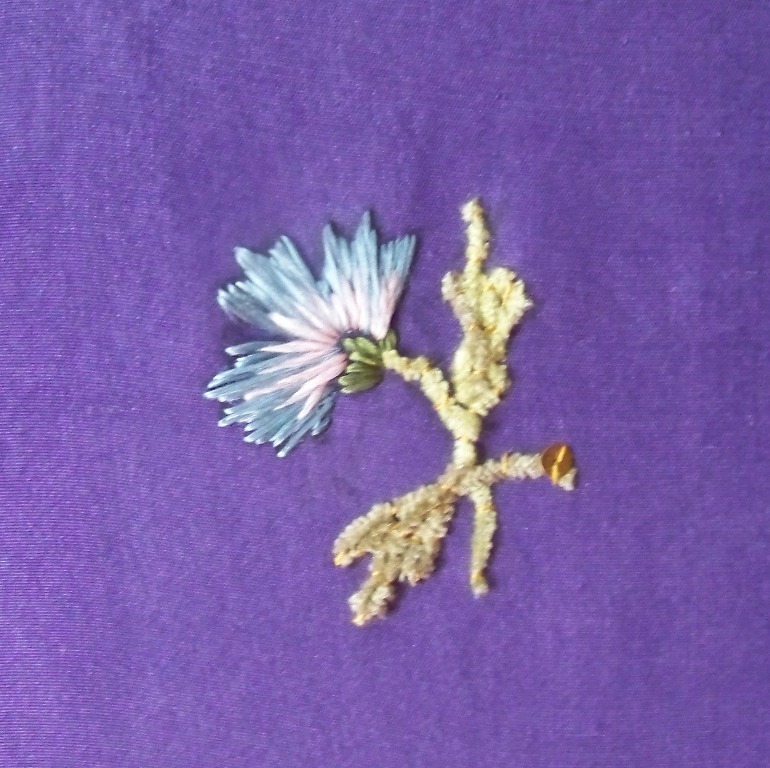 I've just finished my own, embroidered flower, and it too is luminescent, this time in a soft blue and pink that a carnation never wore, so maybe I'll call him a bachelor's button. He's another motif on the sleeveless spencer, and he struggled for hours to come to life. Here's the motif in natural light. His first two incarnations lasted only minutes before I cut them to pieces, poor things. I had the devil of a time with making the petals feel like they were really lifting themselves out of the stem. After all, you cannot curve sewn threads, only couched ones. The first time the petals came out looking like a child's drawing; angles everywhere and nothing alive. Trying him in long-and-short stitch was just as bad, for soie ovale shows spaces in between stitches like nobody's business, and I haven't had practice in that stitch for at least a decade. The Met spencer's carnations didn't offer advice: the blown-up photos have lost any stitch details. 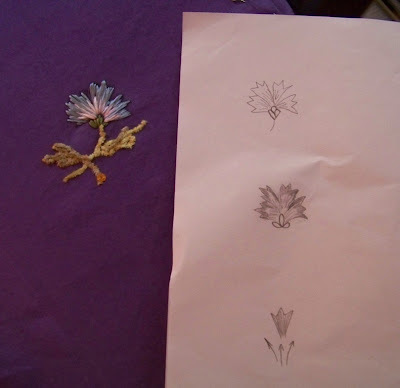 Consulting my embroidery books and 18th Century Embroidery Techniques, and Seventeenth and Eighteenth Fashion in Detail helped very little either, for they illustrate no carnations close up; all I got was the sense that threads might overlay and fan to produce a growth pattern. 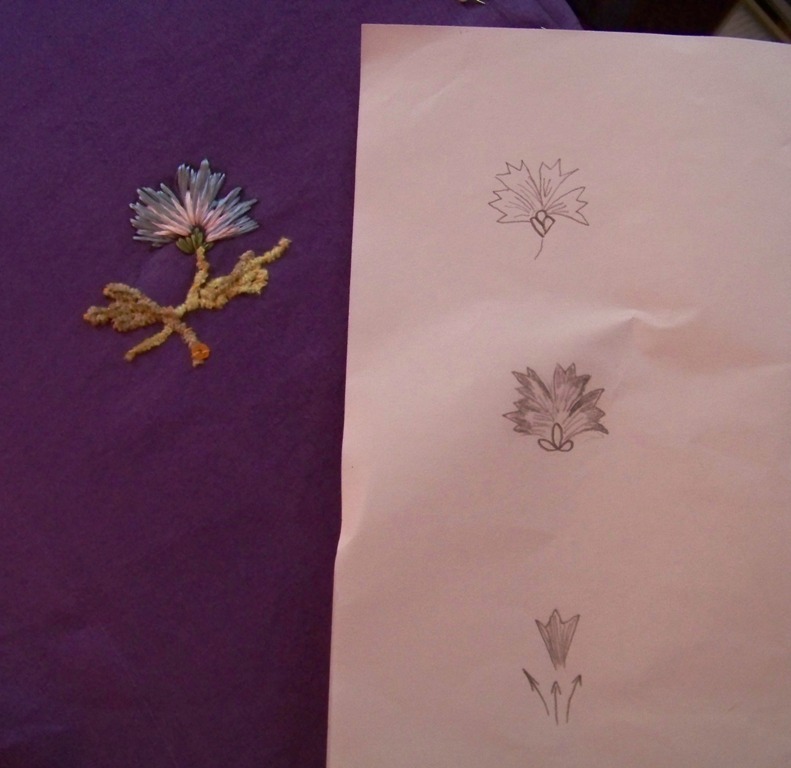 My Pinterest files brought nothing; all my carnation images are in tambour stitch. Grr. So it was pencil to paper to experiment, and finally I came up with stitch directions that seemed sensible. The third round I allowed to fan the threads a bit, allowed some threads to overlay one another at the base, and I followed the petal growth directions, but gently. I let the needle and thread paint, sometimes laying the thread atop the fabric where I wanted it to go to assess direction, before I poked the needle to the back. The stem and leaves were another challenge altogether. The leaves are sharply pointed, something that's not easy to do in silk chenille. The first petal is wonky, but the second leaf came out okay, after I'd learned to shape and fold the chenille to follow outlines and to use couching stitches to create sharp corners. I'd tear out the first leaf except that the couching thread continues to the second leaf and I haven't the heart to redo it just now. You can see the results of the last effort above. Once again, the laying tool was integral to shaping most stitches, and essential for finally smoothing everything. For a first carnation, I am pleased. Long may he bloom. I heard the sound in the distance while at work here at home Friday, what they call a drone, large somethings beating the air and slicing it into falling pieces. I knew it had to be a propeller plane and a big one. The drone grew louder and in spite of knowing that I had nothing to fear, those cut-up slices of sound falling from the sky were menacing. 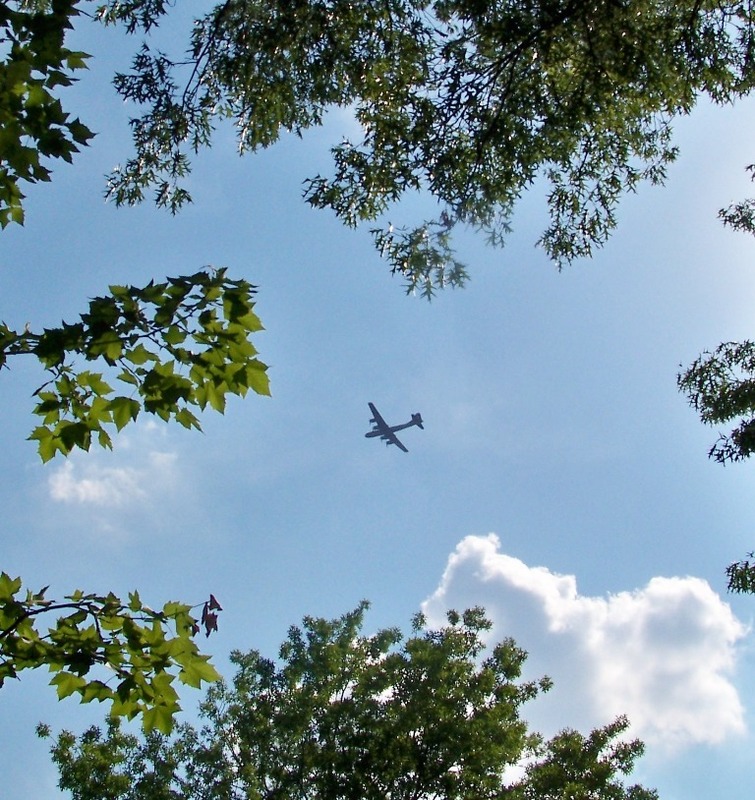 She flew overhead, right over our house, quite low, and the sound resolved itself to one I've heard in the movies. There were four big engines driving the propellers, and snub nose, a silver glow, wide, rounded wings. She was actually quite beautiful, and she sounded close up like an army of giant beetles. From this angle I couldn't see the narrow rods jutting out that would be her machine guns. I knew her name was Fifi, having read about her visit in the newspaper. 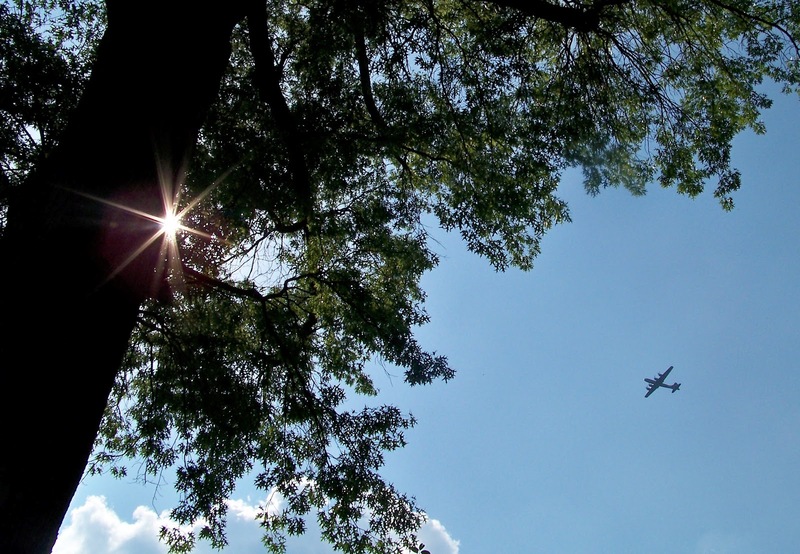 She's the last Superfortress still flying; her sisters are all gone, the two most famous, or infamous, living in museums now, memorials to the nasty birth of the atom bomb. 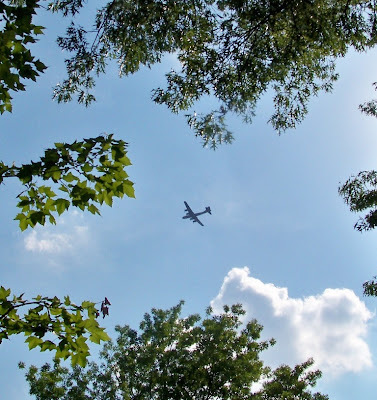 Over the next two days she would fly overhead perhaps eight or nine times, and each time all of us who could would careen outdoors to listen and watch her. She is a living memory of an era so terrible and such a part of our collective human history that she must be listened to. My husband and I took the boys to the aviation museum last evening in the hopes of seeing her up close, but the museum had already closed. So we hooked our fingers into the chain link fence and looked at her. On the ground she was menacing once again, although that didn't impair her beauty. It was the gunners' positions, the machine guns the only sharp edges on her, that gave her nature away, and the doors in her stomach that had let fall how many thousands of bombs. This morning, they and my mother visited again, and this time they toured the museum and saw her up close. I was confined home with yet another cold. I won't say more. What do you say to something beautiful that's also destructive, whose every silhouette is a mixture of sublime design and embodied proof of man's propensity to mix the hideous and the incalculably stupid with the heroic and the selfless? Wow, you are a poet! I hear tribute to a certain famous haiku here too: "A silver sliver and a dull drone..."
So beautifully put, Natalie, these planes are beautiful and menacing - beautiful in design and menacing in its implications. Unlike your carnation, which is just beautiful! I looked up the haiku. Oh, goodness. I'd not read it before. You can clearly imagine that gloved hand and that button. Phew. It encompasses what I was feeling so succinctly; what took me paragraphs took just syllables. I have two more carnations to go, and a few more daisy-type flowers. Decided not to embroider the shoulder straps because they are too narrow. Getting close!